We were the only two patrons. “We don’t technically open until 9,” the bartender told us. It was 8:45. We asked if we should come back. She said she was ready, so we sat down and had a drink. My friend knew the bartender, and she served our food and drinks in between prepping for the evening. I conferred with the bartender. Indeed, the place saw many people my age later in the evening. But I was usually in bed by the time life picked up here. The karaoke guys came in to set up. Then a mustachio’d man slid up to the bar, casually placed a clear plastic bag down in front of him and sat down. The bartender greeted him like an old friend and poured him a drink. I glanced over. He had a long twist of a ponytail. And were those condoms I saw in his bag? My friend and I continued our conversation and I peeked over again. Now the pony-tailed guy had a second plastic bag in front of him, this one empty. He pulled long lines of condoms out of his first bag, tore them apart, and placed the singles in the second bag. No way, I thought. Then I remembered I was in Asheville. So a man sitting at a bar with a bag full of condoms really shouldn’t be that surprising. He explained the flow of money that allows the Western North Carolina AIDS project to purchase thousands of condoms to give out for free. “I go around to the local bars and put them out in bowls,” he explained. “There’s a bowl back there,” he said, pointing to the bathroom. “And Rosetta’s has one.” He then proceeded to tell me all the places he made his rounds, filling bowls with free condoms for people to take. “But are they all of age to be in need of condoms?” I asked. “Colors?” I asked, picking one up. The conversation got a little more descriptive after this, and I’ll refrain from quoting it here. Mustachioed man told me how he does his weekly rounds, sitting at bars like this, striking up conversations just like this one. “They make great stocking stuffers,” the mustachioed man told us as he continued to break apart the long strands. “Need any?” I asked my friend. “No – I have a friend who works at Planned Parenthood. She gave me a bunch the other day.” This is Asheville after all. Free condoms are seemingly everywhere. I was roaming around an art gallery when this conversation took place. It was my “birthday eve.” I had never thought to celebrate the eve of my birth, but I’d just had a cup of tea with a wizened elder of the Asheville community who suggested it. So upon leaving her apartment downtown, I decided to see where life took me. I wandered down Haywood Street and saw the display window for the Updraft Gallery around the corner on Walnut. I’d wandered in there the previous week. Back then, they were still getting the gallery set up and I talked to one of the owners about how they came to get the space and start the gallery. I saw from a sign in the window that they’d had their opening the previous night, and I would have attended had I not had twenty-five people at my house to celebrate my aforementioned birthday. Despite the fact it was 7pm on a Sunday night, the lights were still on and people were looking around. I walked past, but my intuition told me (more than once) to turn around and go in. So I did. Andrew, the glassmaker I’d met the previous week, was demonstrating his technique to four customers. As he did so, I took my time looking around. I slowed down and spent long moments taking in each of the works around me. As usual, I found myself staring at one piece in particular that brought tears to my eyes. This happens every time I roam galleries alone. I can’t explain what it was about the piece that moved me to tears. All I can say is that I’m no longer surprised when this happens. I simply give in, take a deep breath, and keep staring at the image in front of me – in this case a full, bright moon hanging in a dark blue night sky, over ocean waves. I eventually moved on and watched Minna, another of the owners, working on a piece of jewelry. “Hello quiet girl,” she said to me. I smiled. Quiet girl? Me? Oh how I loved the feeling that flooded me when she said that. It brought me back to my childhood when “quiet girl” was exactly who I was. I inquired about the piece she was working on, and then made my way to the back of the gallery. After the other customers left, I found myself in conversation with Minna and Andrew. Topics ranged from Eleanor Roosevelt’s quote about the present being a gift, to the difficulties of making a living as an artist, to the trials and tribulations of being a mother of grown children or a father of a toddler. At some point in the conversation Minna decided I should meet her young friend, and thus the earlier conversation about my age. Some years ago, I saw on Oprah’s web site that they were looking for people who looked ten years younger than they actually were. At the time, I thought I could only pass for only 8 years younger, so I didn’t write in. Ever since then, though, I’ve thought about the questions Oprah would ask me on the topic of aging, and what I’d say in response. Oprah: So, Rebecca, why do you think it is you look ten years younger than you really are? Rebecca: Well, I think it has something to do with having done what I want to do for the last thirteen years. Being unhappy with your life doesn’t make you look younger. But when you live a life completely by your own choice, you have a certain optimism and a certain outlook that makes you happy to be where you are – and people that are happy, I think, usually look younger than they really are. And feel younger, too. Oprah: And you also mentioned something to my producers about kids and marriage. Rebecca: Yes. I have neither. I’ve heard both age you. Not that I’ve chosen to be childless and single to look younger. But I’m sure it helps on some level. The married women in the audience, who have children at home, would nod and smile, secretly wanting to kill me for that last remark. But I do wonder about aging and why it is I’m doing it a little slower than some people. Maybe it’s because I really don’t care? Would I care if people thought I looked ten years older than I am? Or if the lines that appear when I smile were always present? I don’t mind telling people I’m 36. It’s a number. Some people, at 36, look 45, or 35, or 25. What causes it? What does it matter? I was in a friend’s wedding a few weeks ago. I sat in a chair while the hairdresser talked to me about the style I wanted for the occasion. “On which side do you part your hair?” she asked. She did that and then stopped. “Oh, no, we can’t do that. You have a gray hair there.” She proceeded to move my part. Seriously? I thought. One gray hair? You’re going to change a hairstyle over one hair? It’s her profession. I guess she knows what she’d doing. Do that many people really care so much about one gray hair? Life is really too short for such concerns. At least, my life is too short for such concerns. 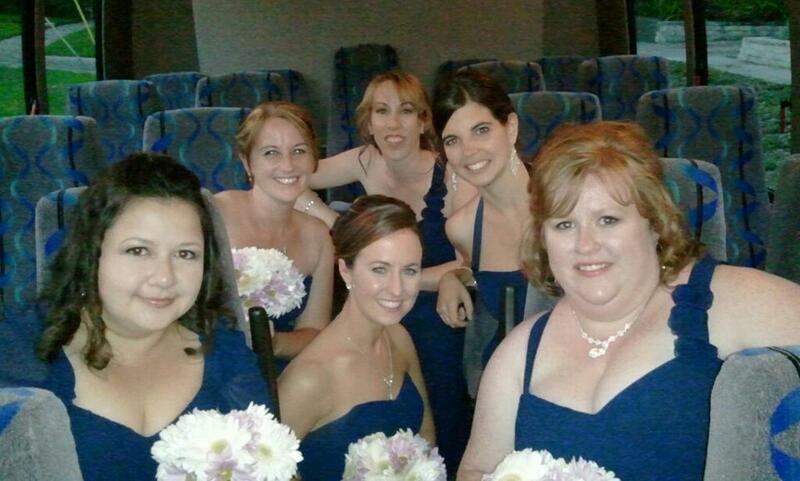 I’m the brunette on the right…the one whose single gray hair is conspicuously concealed.